Imagine it's just any ordinary Monday morning, you're walking to school & suddenly you see this greeting you at the door. 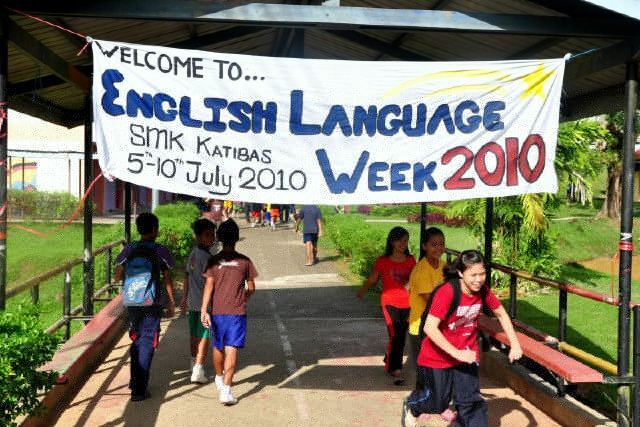 Last week, SMK Katibas celebrated the English language by having the English Language Panel (ELP), in conjunction with the English Language Society (ELS), organise the 2010 English Language Week (ELW)! For the opening ceremony, we buried a Time Capsule. Every student from every class was given written or semi-writing assignments to complete in the English language & be placed within the capsule. 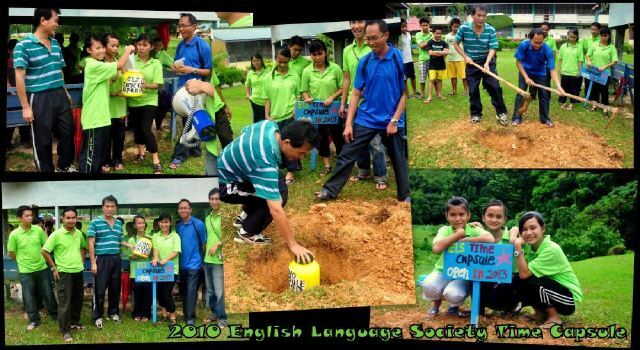 Teachers & staff were invited to contribute as well. To be opened during ELW 2013! Every afternoon of ELW, there was an ELS BBQ to sell scrumptious burgers & savoury hot dogs fresh from the BBQ pit! We sold out 40 burgers & 40 hot dogs in 2 afternoons! The ELS will be doing this once a fortnight to raise funds to pay for their T-shirts (instead of burdening their already cash strapped parents). 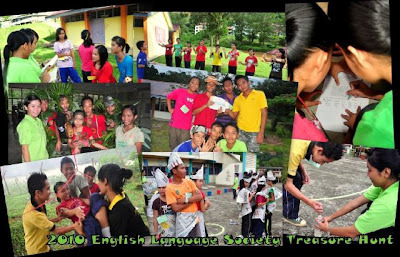 They learn entrepreneurship, practical English language use & living skills all at the same time! There was also a simple school-wide Storytelling Competition where the best storytellers from each class competed for a place in the finals. 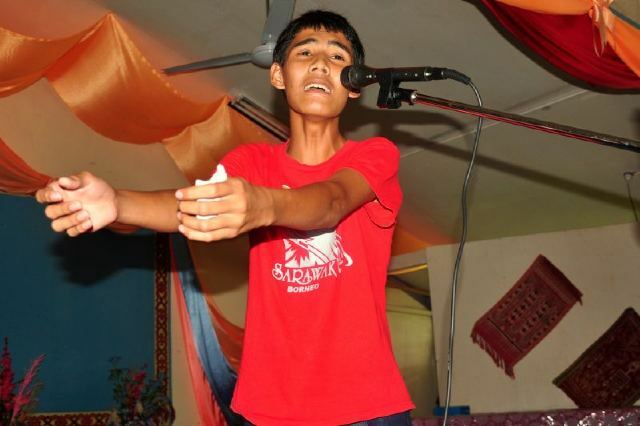 In the end, it was won by this skinny over-dramatic Form 5 boy, Azmi. There was also a Spelling Bee organised for the lower forms. Students were given a list of 100 words to memorise the day before & yet the competition did not last for more than 5 rounds. It was won by a multi-talented Form 2 girl, Leslie. For the upper forms, a Crossword Puzzle Competition. The student who gets the most number of answers correct wins. I tried the puzzle myself & found it to be really challenging. I only managed 35/40. The winner was Yatie from Form 4. 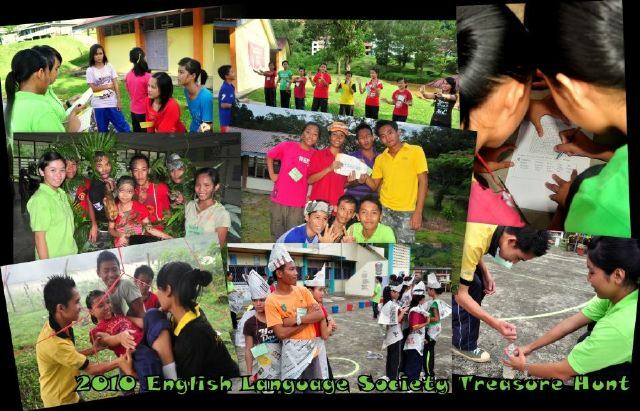 Then, there was the first ever ELS Treasure Hunt. Representatives from each class were divided into groups & had to collect points at different stations. They have to run, lift, dance, sing, act, write & solve puzzles. The top 3 groups will receive a riddle. Solve the riddle & you will discover the location of the treasure (a golden piece of paper). Be the first to find it & win a hamper! 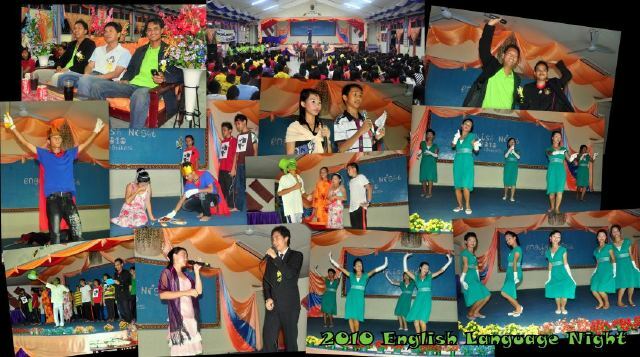 Finally, there was the English Language Night produced by yours truly! Boy, did we have a show for the students & all others in attendance that night! I dressed up in my 3 piece suit & the other English teachers donned blazers. Performances for the night were a duet by the 2010 Teacher Idol, a duet by the 2010 Katibas Idol, a story by the 2010 Storytelling Champion, a sketch & a dance. I sang Jason Mraz's "Lucky" with Norhayati, the Katibas Idol. Even though my mic malfunctioned, we put on a good show. I also produced the dance. I got a few girls together & trained them every night for a month to do the Wondergirl's "Nobody" dance. I bought dresses, gloves & ribbons for their costumes. It was more than magnificent in the end. I absolutely have to commend my colleague, Royston, on a job well done in producing the sketch for the night which was based on "Rumplestiltskin". The casting, the props making, the acting, the abridged plot, the multiple nightly practices & the simplified dialogues they were done with absolute care & attention. I could see that & I am very grateful to have someone like you on my team. 2010 English Language Week was a great success! I have never experienced ELW when I was back in school but my experiences in IPBA & VUW plus the images in my head of what an awesome ELW would be like has really come true. I would like to thank the members of the administration, the ELP, the ELS & every member of the school who directly & indirectly contributed to this dream. It was truly memorable & I believe that it has pushed the English language up a notch in the hearts & minds of the students. I'm already brimming with ideas for next year's ELW!